Xbox game pass is a subscription service where customers can purchase multiple of games at a set cost each month. 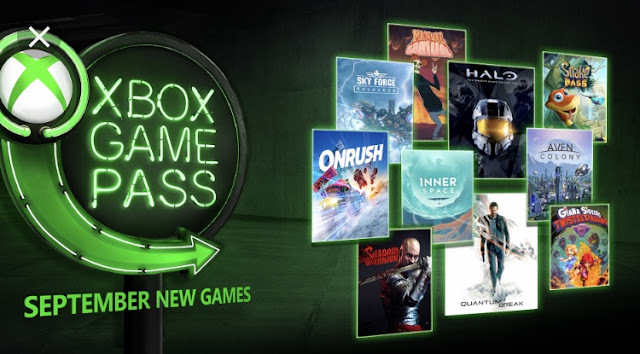 The Game Pass Library includes over 100 Xbox One and Xbox 360 titles, including popular games such as Forza Motorsport 7, Disneyland Adventures, Sea of Thieves and Halo. It has been described as a Netflix for video games. The game pass allows you to access the library to download and play all the games until the pass expires or is cancelled or a game leaves the catalogue. Prices for the Game Pass are £9.99 per month or you can get a 6-month pass which is £48. Once your pass is active you can access the games in the library and play as often as you want, which is a great way to try out lots of games. As the games are all stored online on the Xbox library there are no pricey games to buy or keep safe - they always seem to go missing or get broken in our house. You can even play Xbox exclusives on the day they launch and you can play Xbox Play Anywhere games on your Windows PC and Xbox One. With so many games to try from, there will be games for the whole family to enjoy. If a game does leave the library as a Game Pass member you can save up to 20% off the purchase price of Game Pass Games plus 10% off DLCs. Smyths have kindly offered one of my readers the chance to win a 6 month Game Pass subscription worth £48. To enter simply fill in one or more of the entry options on the rafflecopter form below. The winner will be chosen at random from all correct entries received by the closing date of the 9th of December 2018 at midnight. T&Cs apply, please see below. Good Luck! One winner will win one six months Xbox Game Pass Subscription worth £48 only. Winner will be selected at random via rafflecopter from all correct entries received by the closing date of Sunday 9th December 2018 at midnight. Winner will be contacted within 48 hours of the giveaway closing by the email address provided, the winner will have 28 days to claim their prize before another winner will be selected at random. No cash or prize alternative. Giveaway open to UK entrants aged 18 + only. No emails or personal details will be stored or used in any way by entering this giveaway and only the winner will be emailed. Smyths have kindly provided the prize. Please allow up to 30 days for delivery of prize. Disclosure This is a collaborative post with Smyths Toys, I have been compensated for my time in hosting this giveaway with a voucher. I would give the pass to our sons to share, but from previous experience they may say the games available aren't the ones they want to play which are always the latest and most expensive. I have two sons aged 11 & 13, they would love this pass! My husband would be the incredibly pleased recipient of this prize, if i'm lucky enough to win. Thanks for the chance. I would give this to my son, he would definitely use it. So i can play a vast majority of games freely. I would give it to my little brother. I would use it for myself as I need one. This would be for my son. He works so hard at school that I don’t mind him relaxing with a bit of gaming in the Xbox with his friends.